Spring marks the beginning of fire ant season, when warm weather and frequent rains brings the ants above ground where they build dirt mounds that dot the Texas landscape like a terrestrial pox. For us here in the Lone Star State, fire ant season can stretch well into fall. These little red pests may look harmless, but their bites can be devastating, as they sometimes overwhelm and kill newborn livestock, wildlife and can even cause anaphylactic shock to some humans. Fire ants can re-infest from long distances and the reproductive potential is great, so it is important to treat not only the mound, but also the surrounding areas in your yard to stay ahead of them! At J&N Feed, we’ve got two options for fire ant control. Treating early and often is the key to controlling these pests. Over’N Out! 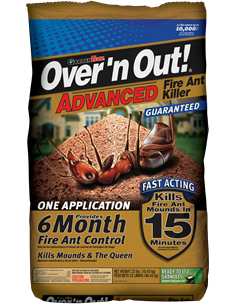 Advanced – Stop the fire ants early with Over’N Out! Advanced fire ant killer from GardenTech. The deep-penetrating and odorless formula kills the pesky pest and their queen. Treat the mounds to kill fire ants fast, then apply the ready to use granules to your yard to prevent new mounds for 6 months. The 11.5 lb. bag covers up to 5000 sq. 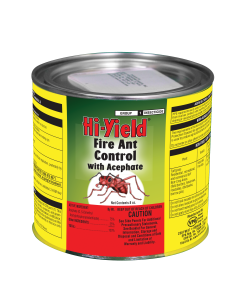 ft.
Hi-Yield Fire Ant Control may be used in a variety of exterior settings include fields, pastures, recreational, residential and landscaped turf, for excellent control of fire ants. To get the best results, apply the product around dawn or dusk, because that is when the ants are most active. This entry was posted on Sunday, March 31st, 2019 at 9:00 am	and is filed under Garden, News & Updates. You can follow any responses to this entry through the RSS 2.0 feed. Both comments and pings are currently closed.